Actress Francesca Capaldi Hosts Peanuts-Themed Valentine’s Day Party, Plus Enter to Win a Peanuts Gift Set! 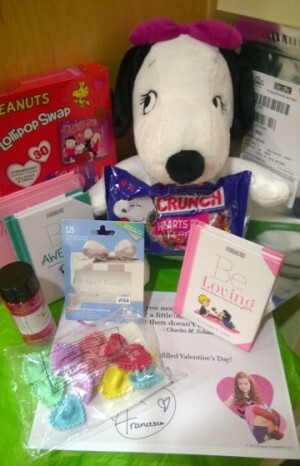 Actress Francesca Capaldi Hosts Peanuts-Themed Valentine’s Day Party; Plus Enter to Win a Party-In-A-Box Gift Set! Valentine’s Day is just around the corner and what better way to celebrate than with Peanuts—where Sally loves Linus, Charlie Brown loves his Little Red-Haired Girl, and everyone loves Snoopy! 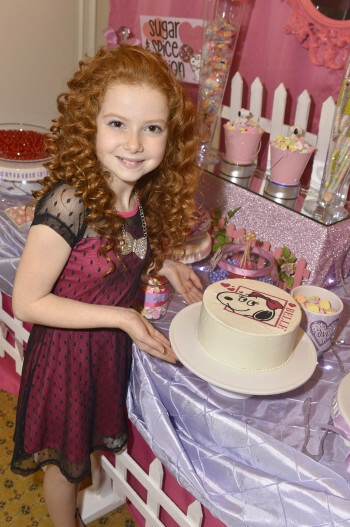 Last Saturday, adorable 10-year-old actress Francesca Capaldi, who stars as Charlie Brown’s beloved Little Red-Haired Girl in the upcoming The Peanuts Movie, hosted a Peanuts-themed Valentine’s Day party with Snoopy and his sister Belle at the Park Hyatt in Carlsbad, California. Actress Francesca Capaldi puts her heart into her Peanuts Valentine’s cards, which are included in our giveaway along with extra foam hearts and jewels to enhance your card. Francesca, who’s also one of the stars of Disney’s Dog with a Blog, and her friends enjoyed Valentine’s Day card-decorating, delicious cakes and cupcakes, and of course a showing of the classic TV special, Be My Valentine, Charlie Brown. 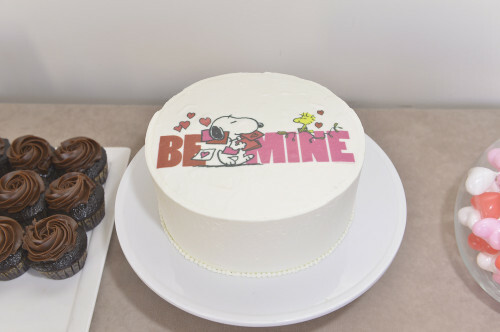 Francesca was sweet on the beautiful Snoopy and Belle Valentine’s cakes at her pre-Valentine’s party. You can make this same cake using the Park Hyatt’s recipe, and if you win the giveaway, one of the delicious DecoPac Snoopy or Belle toppings will be included! You too can make this delectable cake! Combine the buttermilk, oil, eggs and vanilla together with a whisk. Place the flour, sugar, salt, and soda together in a mixing bowl. Using the whip attachment on an electric mixer, add the liquid ingredients that were previously whisked, mix only until smooth. Boil the water and add it to the cocoa powder and whisk until smooth. Add the cocoa mixture to the previous batter. Let the batter sit 10 minutes before filling pans. Fill 2-8″ cake pans that have been greased and floured. Fill pans half full. Bake in oven at 350o for approximately 45 minutes. A knife inserted in the center will come out clean. Cool cakes before using. Very easy to make, basic buttercream is ideal for icing cupcakes and for piping decorations and borders. It will stay fresh at room temp for 2 days and can be refrigerated for up to 2 weeks. Combine all ingredients in a large mixing bowl and mix at slow speed until smooth. If stiffer icing is needed, or if the weather is very warm, add a little more confectioners’ sugar. CLICK HERE for info. about the Peanuts cake decorations. 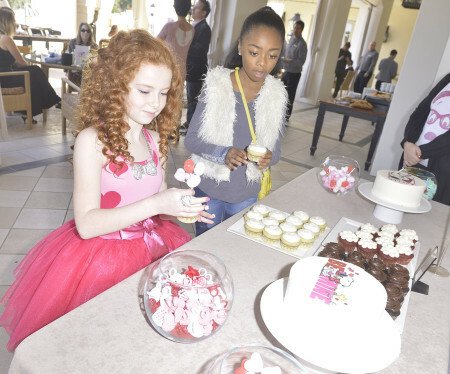 Francesca and Skai Jackson from Disney’s Jessie had a sweet time decorating cupcakes. You can create your own “cupcake couture,” following the recipe from the Park Hyatt and using the DecoPac decorations in our giveaway. Now you can re-create this fun party with your own kids thanks to this fabulous Peanuts Party in a Box! This can be yours! See contest rules below! ENTER TO WIN THIS FAB GIVEAWAY: Check out the simple rules below! If you’ve already done #1 then you just need to do #2! 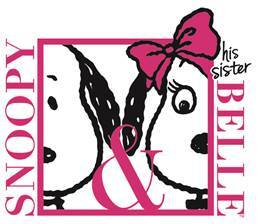 Meanwhile, prepare yourself to fall in love with Peanuts all over again as we await The Peanuts Movie. Charlie Brown, Snoopy, Lucy, Linus and the rest of the cherished “Peanuts” gang make their long-awaited big-screen debut in stunning state-of-the-art 3D animation from 20th Century Fox and Blue Sky Studios. Congratulations to our winner, Amy Orvin, from Charleston South Carolina!! I just sent you a message. Thank you for the chance to win. I sent you a message. Thanks for the chance! Thank you for this great giveaway!I sent a message.